To make a simple origami money frog, start with a crisp bill. This will make creases and folds hold better while making the frog. Fold the dollar bill in half horizontally. Fold the top left corner down to the bottom horizontal edge of the dollar. Crease firmly, and then unfold. Repeat with the bottom corner. Using the diagonal creases, form the top part into a triangle. The technique used is similar to that of a waterbomb base and it will resemble one when folded out. This step may be difficult if you have never made a waterbomb base. Fold the right side of the bill towards the bottom of the triangle. Crease firmly. Fold the right side top and bottom corners into the horizontal crease made in step one. Unfold after creasing. Fold the sides of the right half of the bill and the bottom part of the triangle into the horizontal crease. The bill should now resemble an arrow. Fold the right side up to the bottom of the triangle again and unfold. Using the diagonal creases made in Step 5, pull the edges out and flatten, with the top lining up with the crease line made at the beginning of this step. The picture shows Step 7 completed. Fold the right side edges down to form the frog's legs. Fold the tips up so that the frog will stand up. Fold the top triangle points up at a slight angle, then out. Pull down slightly so that the frog can stand on the legs. Flip the frog over and stand it up on the legs. The simple, abstract origami money frog does not hop, but will make a nice addition to a collection of origami animals. 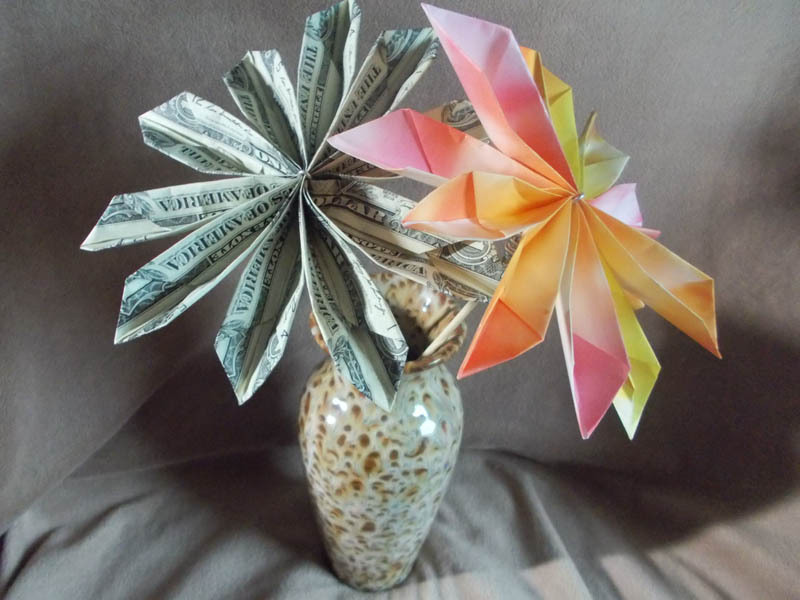 Once you have mastered an origami money frog, try making a money origami heart or money origami flowers using the cash in your wallet.